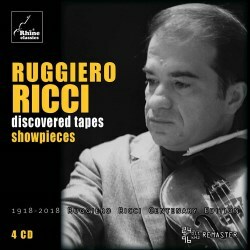 After something of a gap, Rhine Classics is back in business with a tranche of new releases of which the majority concentrate on the explosive art of Ruggiero Ricci. There are two 4-CD sets devoted to showpieces and to sonatas and a 6-CD set to concertos. All capture live recitals or broadcasts. They were released toward the end of 2018, just in time to commemorate the centenary of the violinist’s birth. The project carries the imprimatur of Ricci’s wife, Julia and the original material seems to derive from disparate sources. The earliest material comes from Ricci’s monumental solo violin recital at Town Hall. NYC in November 1946. It’s a shame that Kreisler’s ‘Johann Stamitz’ Choral wasn’t recorded as it’s a rare piece to encounter and nor were the first two movements of Bach’s A minor sonata. Just the Andante and Allegro survive to show Ricci’s distended romanticised approach full of daring dynamics and outsize, unpersuasive gestures. This was a sonata he had recorded on 78s in the 1940s for Vox. It is a feature of this set that ‘showpieces’ invariably includes sonatas, not least as they all fall in the context of live recitals. As an extreme example there are no fewer than three different live performances of Ysaÿe’s Fourth solo sonata, a real Ricci favourite; the one recorded at this 1946 recital with two to follow durng a 1953 German tour in Stuttgart and Saarbrücken. He was always one of the fastest Ysaÿe players on the circuit as these three readings show and there’s little material difference between them. He’s on equally firm footing with Hindemith’s solo sonata No.3 with especially brilliant playing in the finale’s Mozart variations. The remainder of the Town Hall concert is equally powerfully dispatched, not least the four selected Paganini Caprices, ending inevitably with No.24 which gets applauses and riotous whistles long before it finishes. The Ysaÿe and a couple of other items have been released on a Dynamics 10-CD box devoted to Ricci. The other major recital here was given at Carnegie Hall the following year, though apart from the opening sonata by Vittorio Giannini, dedicated to Ricci, everything was piano accompanied by Bernard Frank. There’s some vividly lush lyricism in the cantabile central movement of this addictive work. Elsewhere he omits the Scherzino from Stravinsky’s Suite Italienne. Sporting fine resinous playing in the finale this is a valuable addition to the Ricci discography of a work he never recorded commercially. Nor did he record Jean Hubeau’s Concerto, here of course in piano reduced form. Dedicated to and first performed by Henry Merckel, whose wartime 78 set may have come Ricci’s way, it shows the American’s virtuosic ease as well as his lovely phrasing in the serene slow movement; there’s nothing Gallic about his tone production but he brings the concerto to life with great assurance and Frank brings out the boulevardier element in the finale. There’s some small tape damage around three minutes into this movement. Don’t bypass the smaller pieces from this recital – Kabalevsky, Kreisler, Virgil Thomson’s Spinning Song, and one of Abram Chasins’ Piano Etudes - both these last two arranged by Ricci - a contrasting Milhaud brace, some scintillating Vecsey and Paganini and a typically driving Wieniawski Étude-Caprice. Moving into the 1950s he is accompanied by that adept pianist Otto Graef in Frankfurt in 1950 in Sarasate and Paganini – quite militant bowing in I Palpiti. He plays the solo Geminiani sonata with decorum and thoughtfulness and Paganini’s Nel cor più with blistering brio. It seems Ricci never got around to Tartini’s Devil’s Trill sonata commercially so the existence of this 1970 reading broadcast from the studios of Hellenic Radio in Athens makes up for that lacuna. It’s quite straightforward and not subject to any extremes of tempo; there’s some unsteadiness in the cadenza. The second performance of La Campanella is here and there’s also Smetana’s From the Homeland, which lacks requisite nobility. The final recital comes from November 1986, in the Teatro Comunale, Monfalcone. It was recorded by Emilio Pessina in situ on tape with Ricci’s permission. This consists of one of Ricci’s great set-pieces, a complete recital of Paganini’s Caprices in an ordering of his devising. It starts with numbers six to twelve, and then backtracks to numbers one to five before the intermission. For the second half Ricci sticks to the ordering, giving the audience numbers 13 to 24. One hears him tune and re-tune during the recital from a vantage that sounds like middle-of-the-stalls (whether it was or not I can’t be sure). The recording is inevitably a tiny bit rough but it’s good for the circumstances and Ricci ends with two brief self-announced pieces to end a recital of drama and bravery. His tone has rather coarsened over the succeeding years, inevitably, and passagework is not as clean as younger competitors in this repertoire, but his fighting instincts remain unimpaired. This lovingly compiled release has been very well engineered, from disparate source material, and features an attractive, photograph-laden booklet. The 24bit 96 kHz remastering sounds excellent. This is a boon for Ricci collectors.